913-959 Although his reign dates span almost half a century in truth he was a puppet for most of that time, his legal title existing only on paper. First he was under the supervision (more properly called a regency) of relatives and aspiring power players and finally by his father-in-law, the general Romanus, who pulled every dirty trick in the book short of execution in order to advance his own dynasty. In the end Constantine survived them all, stripped Romanus' sons of their own usurped imperial titles and go on to successfully rule as a true sovereign for his last fifteen years. During this time Constantine was wise enough to continue Romanus' legacy of wise administration, land reform and diplomatic finesse when dealing with foreigners. By carefully balancing the needs of the empire and thoroughly considering his options when dealing with threats domestic and foreign he was able to strengthen the economy, enact some commendable social reforms and keep the military up to par. 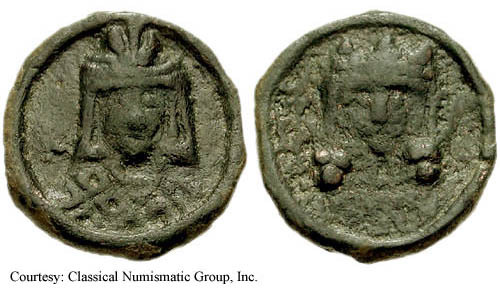 SB 1740, DOC III 2.1 AU Solidus Obv: +IhSXPSR XR GNANTI M - Crowned figures of Constantine and Zoe facing, holding patriarchal cross between them. Rev: Nimbate Christ enthroned. 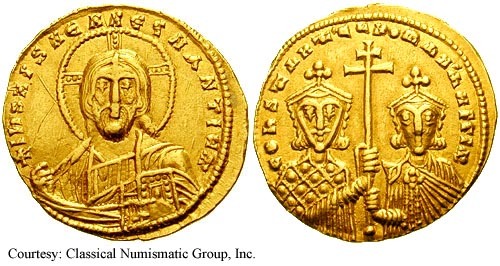 914-919 (Constantinople). $2,500 4/1/01. SB 1743, DOC III 6 AU Solidus Obv: Constantine VII standing on left, holding globus cruciger and raising hand and Christ standing on right, touching Constantine VII and holding Gospels. Rev: COhS AN XPIS OF,b'RI - Crowned facing busts of Constantine VII and Christopher together holding patriarchal cross. 921 (Constantinople). SB 1745, DOC III 7 AU Solidus Obv: Crowned facing busts of Romanus I and Christopher, holding patriarchal cross between them. Rev: Christ seated facing on lyre-backed throne. 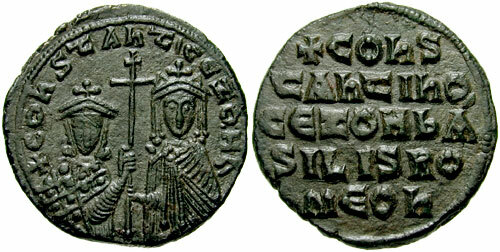 921-931 (Constantinople). $340 5/22/02. SB 1746, DOC III 4, BN 10 AU Solidus Obv: +IhSXPSR XR GNANTI M - Christ seated on lyre-backed throne. 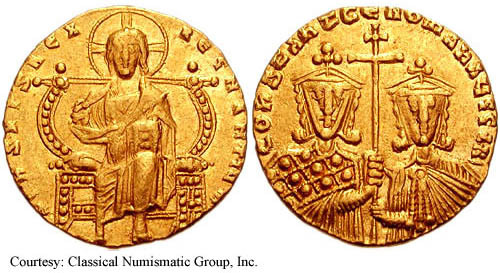 Rev: ROMAN' TCOhS Ah 'A GGb' - Crowned busts of Romanus I and Constantine VII, holding patriarchal cross between them. 921 (Constantinople). SB 1747, DOC III 13 AU Solidus Obv: Facing bust of Christ, nimbate, raising right hand in benediction and holding Gospels in left. Rev: Facing bust of Constantine VII holding globus cruciger. January - April 945. SB 1749, DOC III 10 AU Soildus Obv: - Christ seated on lyre-backed throne. Rev: Constantine and Romanus I, each holding globus cruciger, holding patriarchal cross between them. 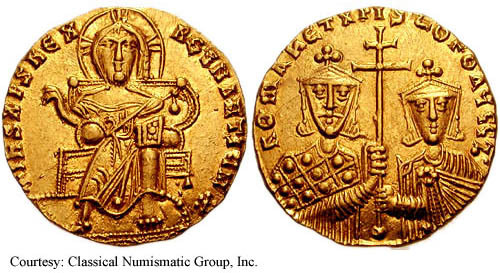 931-944 (Constantinople). $2,100 4/1/01. SB 1750, DOC III 14, BN 14 AU Solidus Obv: +IhSXPSREXREGNANTIUM - Christ seated on lyre-backed throne. 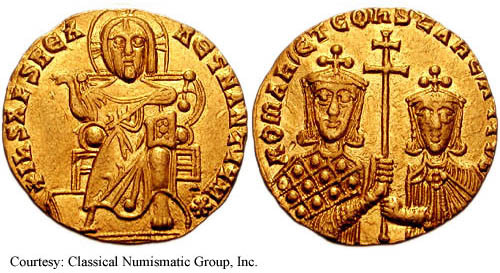 Rev: COnSTAnTCEROMAn'AUGGbR' - Crowned busts of Constantine and Romanus II, holding patriarchal cross between them. 945 (Constantinople). SB 1751, DOC III 15.8, BN 15 AU Solidus Obv: +IhSXPSR XR SNANTI - Bust of Christ facing, holding Gospels. Rev: +CONSTAnT'CEROMAn'AUSSIR - Crowned busts of Constantine VII and Romanus II, holding patriarchal cross between them. 945-959 (Constantinople). SB 1754, DOC III 18 Miliaresion Obv: IhS SXRIS ShIC - Cross potent on base and three steps over globe. Rev: +RO hO,/XPISTOPOR,/C COnSTAN,/ hXW VS /b'b SIL'R' - Legend in five lines. 921-931 (Constantinople). SB 1755, DOC III 20 Miliaresion Obv: IhS SXRIS ShIC - Cross potent with medallion of Romanus I on base and three steps over four pellets; R/W to left and M/A to right. Rev: +RO hO,/COhST h '/S F hOS/C COnST '/ hXWb'R, - Four pellets above and below legend. 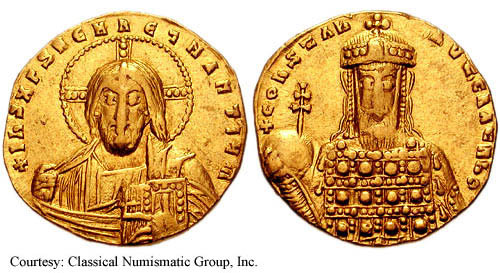 931-944 (Constantinople). SB 1758, DOC III 22 AE Follis Obv: COhStAhtCEZOHb - Crowned facing busts of Constantine and Zoe, holding long cross between them. Rev: +COhS/tAhtIhO/CEZOHbA/SILISRO/MEOh - Legend in five lines. 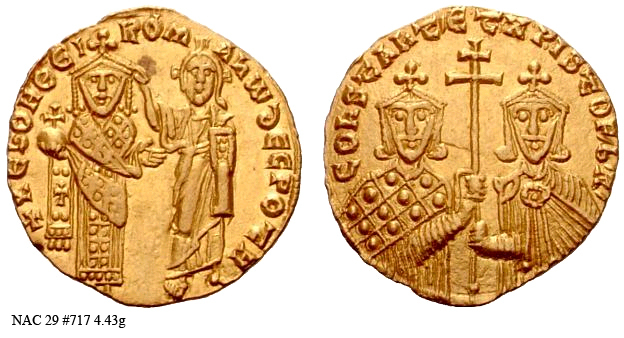 914-919 (Constantinople). SB 1763, DOC III 28 AE Follis(?) 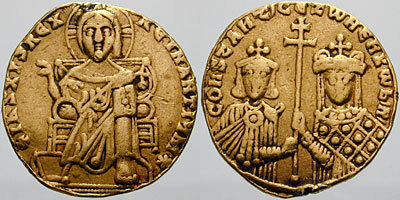 Obv: COhStAhtCEZOHb - Constantine VII crowned, facing bust wearing loros. Rev: Zoe crowned facing bust. 914-919 (Cherson).